Imagine a children’s story scenario in which talking animals, animate toys and regular humans co-exist, but rather than the candy-coated fantasy land found in such tales these characters inhabit a Lynchian landscape of surreal seediness. That’s exactly what creator Ted Stearn has achieved here and the results are both dreamlike and picaresque as lovable and innocent teddy bear Fuzz and his pal Pluck, a denuded rooster, find work at Lardy’s sandwich joint only to become separated and embark on strange journeys of despair and violence. Fuzz is savaged by an unfriendly dog while out on a sandwich delivery and ends up partners with Victor, a nutcase who enlists him in a feeble war against a bridge whose access over a river he seeks to curtail in favor of his own exorbitant ferry service, while Pluck's violent encounter with some delinquents at the restaurant catches the eye of a local fight promoter and launches him into a new career as an unlikely gladiatorial badass. 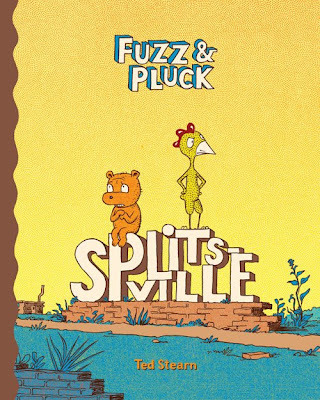 The narrative bounces back and forth between the two plots and much lunacy ensues before the titular pair are finally reunited, and while never dull the segments featuring Fuzz’s predicament pale in comparison to the truly lysergic and disturbing arena adventures of Pluck. And when was the last time you read a story with a bad-tempered halved lemon with fly wings as one of the villains?